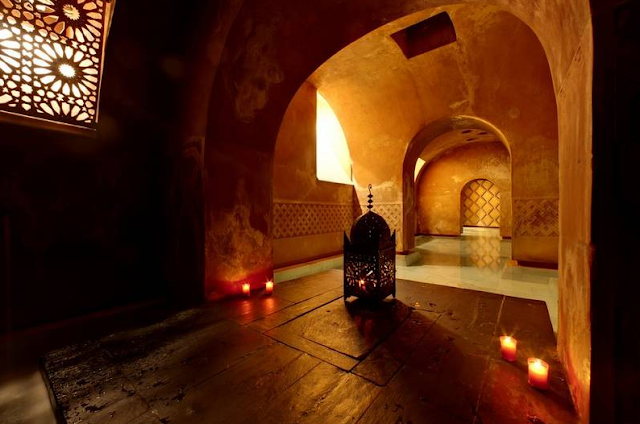 The best thing about the Hammam Al-Ándalus is that while all four of their locations in Spain are totally different, you are guaranteed to have an incredibly authentic experience in relation to the history of each city. Madrid is the perfect example of this. The Arab history in central Spain is tied more closely to nearby Toledo, but Madrid - then known as Mayrit - was an important Moorish outpost starting in the late 700s and for the duration of Moorish Spain. Hammam Al-Ándalus in Madrid not only respects this history, but literally submerges itself within it. 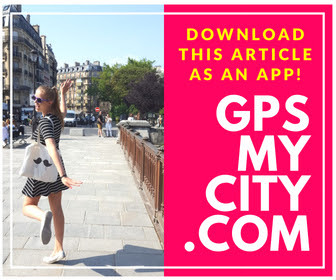 Closely located to both Puerta del Sol and Plaza Mayor, it is easy to locate and enjoy within the heart of Madrid. As I entered the hammam from the busy street, my steps immediately took me downstairs into a totally different world in the preserved caverns of a former well. The facilities gracefully incorporate original design elements with the exposed clay and brick and beautiful archways. The aspect that sets apart an Arab bath experience from a spa is the ancient Moorish tradition of stimulating circulation for health and hygiene. The three spacious pools have distinct differences in temperature to revitalize the body. A steam room and a tea room are both adjacent to the bathing area and add another relaxing ingredient that is fundamental to the experience. The Madrid version of the Hammam Al-Ándalus is especially intimate, with a smooth fluidity of warmth throughout the open space and the more private corners. The arched perspective from the as-sajun bayt (hot pool) to the bayt al-bastani (warm pool) is particularly impressive and creates an elegant viewpoint in every direction. In the tea room of rest, bathers can find ready mint tea from either the prepared teapots or the very unique "tea fountain" that pours tea out of a faucet. All of the aromas of the hammam blend together in this room from the candles and the essential oil selection area. 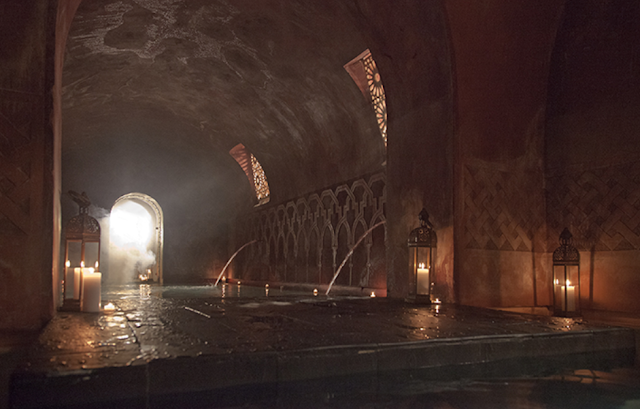 Every Hammam Al-Ándalus offers the scents of red amber, rose, and lavender, and also one scent specific to the city. Madrid's scent is violet, and can be found wafting from candles throughout the entire hammam. Each bather can choose their oil of preference for their massage, or opt for the traditional exfoliating kessa soap scrub, shown below. After the hot and warm pools, the steam room, and hot tea, the bayt al-barid (cold pool) serves as a relief for the body, and ultimately enhances the body's circulation in the most refreshing way. The Hammam Al-Ándalus prides itself on having an open circuit and a complete encounter with the five senses. In Madrid, this is achieved through the sight of the historical decor, the sound of soft Arabic music, the taste of tea, the touch of the water and warm massage, and the scent of violet permeating throughout the chambers. The next time you're in Madrid, plan to spend some quality quiet time at the Hammam Ál-Andalus. It is an organic step into antiquity, and your mind, body, and spirit will be the better for it. Hammam Al-Ándalus Madrid is located on Calle Atocha, equidistant from both Puerta del Sol and Plaza Mayor. I agreed to review the Hammam Al-Ándalus Madrid in exchange for a complimentary experience. All opinions and views are my own. Photos provided by Hammam Al-Ándalus Madrid marketing department. Current Hammam Al-Ándalus Madrid Special Offers.